Bora Bora luxury holidays take you to a tropical paradise island straight out of your imagination. Walk barefoot on pristine white sand, dip your toes in sea the colour of sapphire and relax on a hammock gently swaying under lush palm fronds. In the evening, you can watch spectacular sunsets over a candlelit dinner and sip champagne while a billion stars twinkle in the inky night sky. This idyllic island has a sweet charm that will mesmerise you with its simplicity. As well as being the perfect place to unwind, thrilling adventures also await around every corner. Slow and easy or action-packed, however you choose to spend your time on this wonderful island, the result will be the same - an unforgettable holiday that will stay with you forever. 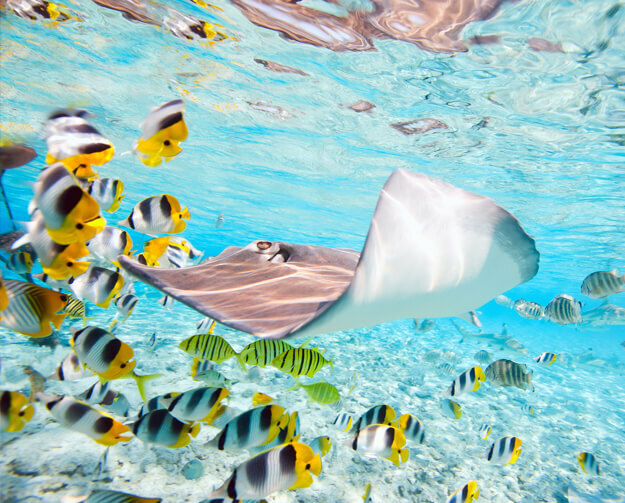 The fabulous warm seas off the Bora Bora shoreline are ideal for diving. Coupled with the sloping reefs and shallow water, divers and snorkelers of all levels will be amazed by the abundance of marine wildlife, with sharks, rays, multi-coloured tropical fish and gorgeous coral gardens providing a treat for the eyes. The Marine Turtle Protection Centre offers a chance to swim alongside turtles in their protected lagoon, or alternatively, head to Anau and observe the magnificent manta rays as they glide effortless through the crystal clear water. Take a leisurely boat ride around the island and explore some mysterious coves, or voyage to Matira Point to kitesurf around a sheltered lagoon. For those who prefer a more relaxing time, either side of the Point is Matira Beach. Offering the perfect mix of aquamarine sea and pure white sand, it’s a beachcomber’s paradise that stretches forever. Romantics everywhere will love the intimate atmosphere of a Bora Bora evening. Enjoy cosy dinners for two as the sun sets on the horizon, followed by moonlit walks along an idyllic beach. If you prefer something more upbeat, you can sip refreshing cocktails at one of the luxury hotels in Bora Bora, listen to live music as you feast on tapas at a local restaurant, or enjoy one of the many traditional dance shows and sumptuous buffets. Don’t miss the chance to sample gourmet food at one of the fine dining eateries along the waterfront, where you can spend the evening tasting freshly-grilled seafood while listening to the soothing sounds of the waves gently lapping the shore. The very name Bora Bora sounds exotic and exciting, and that’s just what this little slice of paradise is. At Azure, we’ll strive to make your luxury holiday in Bora Bora a truly unforgettable experience, from the indulgent and stylish accommodation, to the complete attention to detail of your every desire. We’re confident that we can create a fabulous, tailor-made holiday that makes your dreams come true. Why not get in touch with our friendly and professional team of Bora Bora advisors today by phone or live chat to find out more about our indulgent holiday packages?